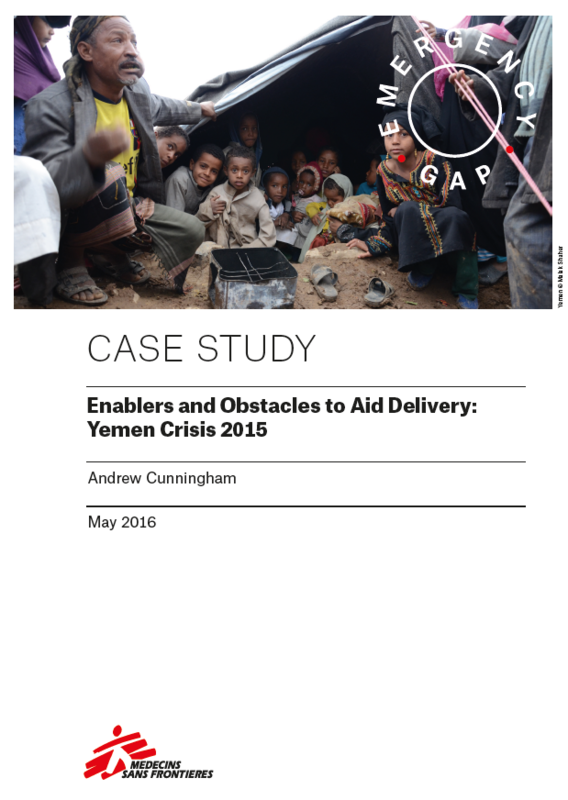 The ability of the system to provide humanitarian assistance in conflicts is shrinking fast. The Yemen crisis being the most recent example of failure and paralysis of the traditional system to stay and deliver. Most INGOS evacuated with the UN when the Saudi Lead Coalition started the aerial offensive in March 2015, progressively returning after June. Once back, the bulk of the system bunkered down in Saana, leaving humanitarian action effectively on standby for months. Local charities were mostly dependent on funds from the UN and donors and even if Yemeni populations have shown big solidarity there has been difficult for most of the local NGOs. Security concerns are put forward by many as one of the main reasons behind the slow return, or the decision not to return for the moment. Certainly the effects of the coalition bombings and ground fighting have been horrendous and traumatic for the population. And there have been very critical incidents such as the kidnapping of an aid worker and bombing or shelling of medical facilities, water points. Was it really impossible to work in Yemen? This panel will bring together a number of perspectives to reflect on the specificities of the Yemen crisis as well as broader systemic implications. Teresa Sancristoval, MSF Emergency Desk in charge of Yemen operations: What allows MSF to stay and deliver? what are MSF's challenges? Nawal Al Maghafi, Indepent Yemeni journalist: How does it look from outside the humanitarian system? Question to Maria. In terms of deconfliction, there is the feeling among the humanitarian community that OCHA is doing nothing else than providing coordinates to the coallition. What do you thing it is the reason of this perception? What else is OCHA doing? Please share or send me the articles of the above authors. I am doing a case study analysis on the Yemen crisis. К сожалению, купить в аптеке крем Биоретин крайне сложно и цена может быть не каждому по карману. Высокая эффективность крема Bioretin обусловлена большим количеством действующих компонентов. Они проникают в глубинные слои кожного покрова, благодаря чему запускают омолаживающие процессы. Это помогает ускорить выработку коллагена и эластина, которые заполняют свободные пространства под кожным покровом. Где купить крем Bioretin (Биоретин)? Чтобы купить Биоретин от морщин, нет необходимости бегать по магазинам, достаточно посетить сайт производителя. <a href=http://pro-zeroprost.ru/biogrow>http://pro-zeroprost.ru/biogrow</a> Носик не забивается, если закрывать его специальной прозрачной крышкой. В одной баночке 30 мл средства. Этого, по идее, должно хватить на весь курс лечения. Наношу на тщательно вымытые ноги утром и вечером. Обязательно перед нанесением вытереть ноги насухо, иначе крем плохо впитается. Использую только на пальцы и ногти, вся нога пока чистая.